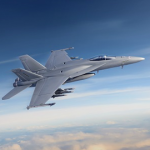 Boeing (NYSE: BA) has received a potential three-year, $4.04B contract modification to provide 78 F/A-18 Super Hornet jets with Block III configuration to the U.S. Navy. The Department of Defense said Wednesday the contract will fund the full-rate production of 61 F/A-18Es and 17 F/A-18Fs for fiscal year 2018 through fiscal 2021. DoD noted the modification converts a previously awarded advanced acquisition contract to a multiyear fixed-price-incentive-firm-target structure. The Navy estimates it will save at least $395M through this procurement strategy. In a separate announcement, Boeing said it will begin to convert Block II Super Hornets into Block III beginning in the early 2020s in an effort to extend the aircraft’s service life from 6K hours to 10K hours. The latest configuration will include network, range capacity, radar signature and communication system upgrades. The company will perform work through April 2024 in California, Missouri, Canada, Minnesota, Ohio, Texas, Florida, Michigan, New York, Virginia and other locations within the continental U.S. The service obligated $1.5B in FY 2018 and FY 2019 aircraft procurement funds at the time of award.